The easiest, fastest way to catalog your books, music and videos. Nothing else comes close. Have a large collection? The unique auto-catalog feature lets you feed in a list of ISBNs, LCCNs, UPCs or barcode scans. Readerware then does the rest, automatically searching the web and cataloging your books, music and videos. Readerware can merge information from multiple web sites to build the most complete database possible, with cover art. Automatically and effortlessly. Want to catalog a few items or build your database while you browse the web? Readerware drag and drop support will do just that. Find a new CD by a favorite artist? Drag from your browser and drop on Readerware. It is cataloged! It really is that easy. 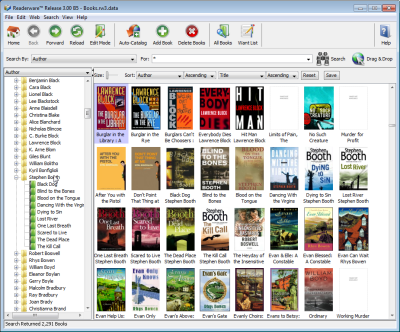 Readerware (Books) – The easiest, fastest way to catalog your books. From a few books to thousands, It will automatically catalog your library complete with cover art. Readerware (Music) – The easiest, fastest way to catalog your albums, CDs, LPs, SACD etc. It will automatically catalog your collection complete with full disc and track information and cover art. No need to keep loading CDs into your drive, just enter the UPC or scan the barcode. Readerware (Video) – The easiest, fastest way to catalog your video library. It will automatically catalog your collection, complete with full credits and cover art. And not just Blu-ray and DVDs but video tapes and LaserDiscs as well. All Readerware products include multiple views, table, tree, thumbnail and detail views, a want list, support for multiple images, media links, loans, import and export, biographies, barcode printing and more. You can search, browse and print your collection, configure the display and database options to present your collection just the way you want. Available in single and multiple user versions. 32 and 64 bit versions are available. Readerware Mobile lets you take your database with you.